Getting the most out of your experience at Denison University means getting involved. There are more than 160 organizations on campus that are a vital part of the Denison University Community. Alford Community Leadership & Involvement Center team recognizes the importance of co-curricular activities as a key part of the college experience. Studies have shown that students who become involved in co-curricular activities in college benefit personally and socially, as well as academically. We encourage you to become involved in student life at Denison and to participate in the many activities offered. Active participation in organizations provides opportunities for the development of leadership skills, interpersonal relationships, self awareness and practical skills and competencies. When considering joining an organization, taking on a leadership position or getting involved in any way at Denison it's always important to consider what your goals are for involvement. Are you passionate about a cause? Are you looking to enhance your skills in a potential area? Are you hoping to engage socially with peers? 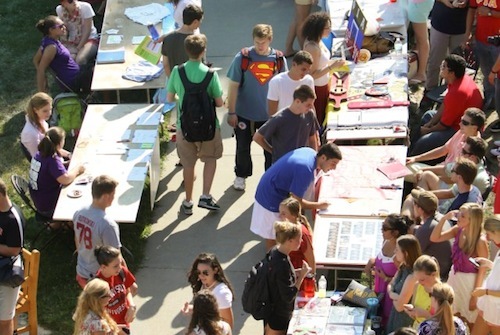 Many students are eager and excited to get involved in a number of things as Denison has so much to offer. You'll also want to carefully consider how much you can reasonably take on alongside your studies and other commitments (like campus job, athletic team, volunteer work, etc). Only you know what is best for you, but remember you are a student first. Consider your schedule thoughtfully and build in time for studies, involvement, work, wellness, recreation—and of course sleep! If you're not sure what kind of organization to join, stop by the Alford Community Leadership & Involvement Center to setup an appointment! We'd love to talk to you about your interests and help you identify an organization that you would enjoy. The Alford Community Leadership & Involvement Center is located on the third floor of Slayter Union, Room 310. Visit us or call 740-587-6394 to setup a meeting! Each semester, we offer an Involvement Fair where you can meet the leaders of campus organizations and learn more about them. Contact clic@denison.edu to ask about this semester's fair!